CINCINNATI, Ohio – Home organization and storage systems manufacturer Organized Living released a new product finish, Century Gray – a soft, medium, neutral gray, in honor of its 100th anniversary. The trend-inspired color provides an elegant finish for its Classica and freedomRail closets, the company says, and it can be a companion color to the rich and saturated jewel-tone shades of greens, purples, and blues currently trending in home interiors. 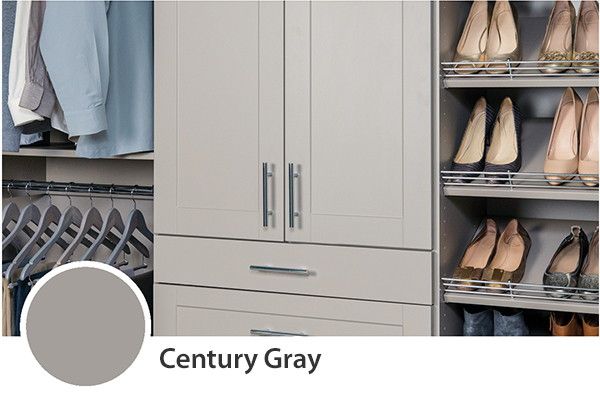 “Century Gray will bring beauty and distinction to areas throughout the home because its warm, neutral tones match any wall color and home décor,” says Theresa Finnigin, VP of Marketing at Organized Living. To view the full color assortment and hundreds of inspiring home storage designs, visit http://www.OrganizedLiving.com.